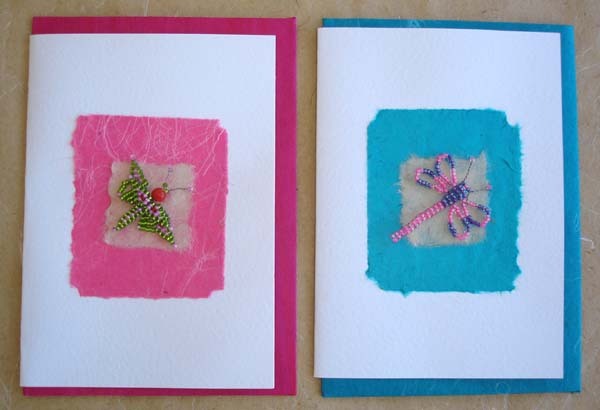 These cards are made by women on a farm in a rural environment. Most of the materials are sourced, created and handmade on site. No two cards are the same because of the multi-layered process of design which ranges from blessings to birthdays. What makes these greeting cards different is their three dimensional surface. The women make their own moulds and cast each piece. Grass, twigs and seeds are also collected on the farm and used to create each work of art. Each one is blank inside giving you the freedom to write your own personal message. Click here for all available cards. 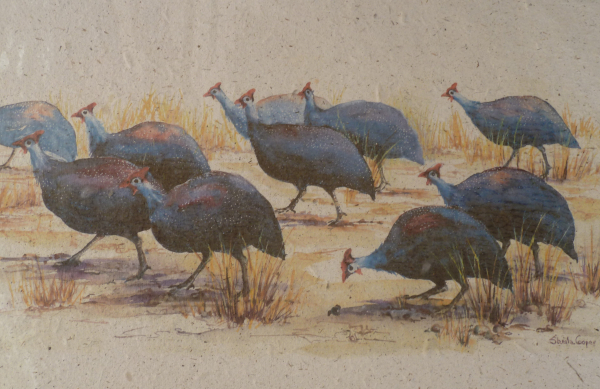 These original framable cards make up a selection of over 36 wildlife paintings printed onto handmade paper using rhino and elephant dung for texture. Each card is unique. Click here for all wildlife cards. Click here for all bird cards. Click here for all other cards. 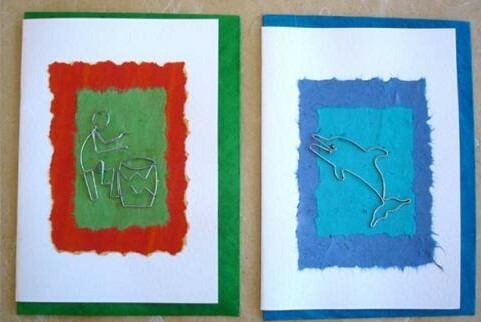 Handmade paper cards decorated with wire art figures and animals. Available with elephant, dolphin, giraffe, rhino, butterfly and drumming man. 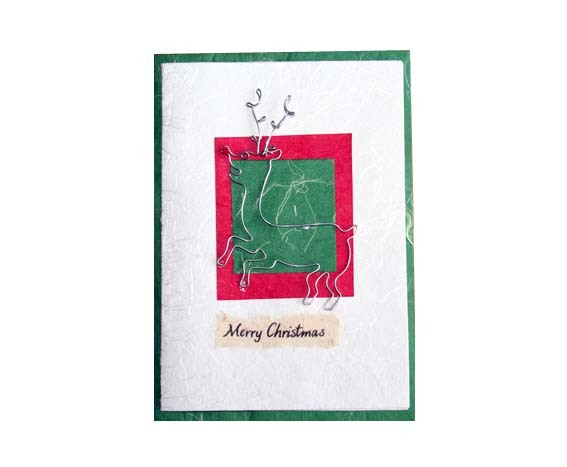 You can find and see wire art Christmas cards here or at the bottom of this section. Hand produced paper card decorated with beads on a wire of hay. 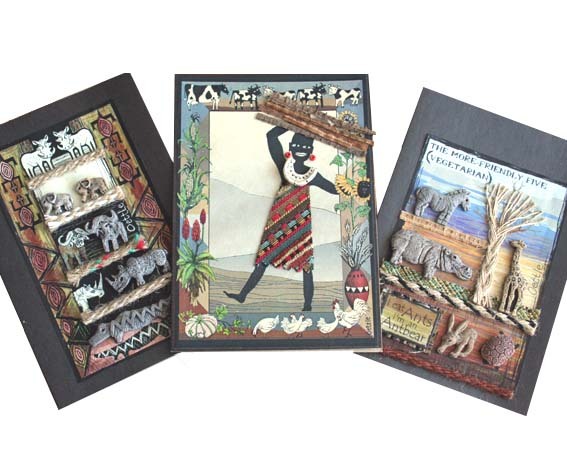 The cards have drawings of animals and African people. 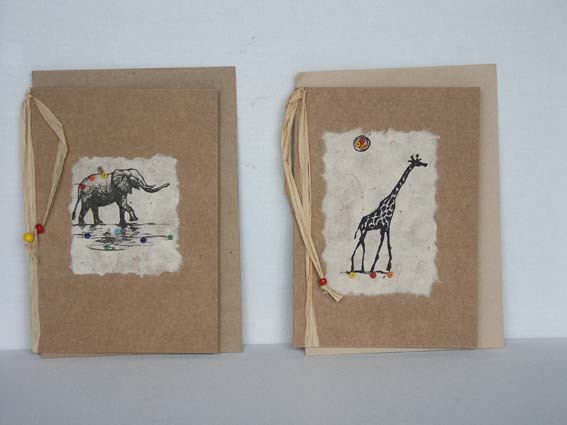 Available with drawings of elephants, giraffe, dolphin, leopard, rhino and lion with cubs. Also with drawings of people in traditional African tribes dresses. Card of hand produced paper decorated with small beaded animals. Available in different colours and animals as butterfly, bee, dragon fly and lizzard.